It doesn’t matter what anybody says, fiction and religion have a connection: at least for the outsiders. For it doesn’t matter whether a person believes in either Jesus or Ji King, this belief is natural for the said individual, an organic part of his or her life, part of the truth. If we examine religious matters, this is a fact that we must not forget. However, if we treat religious questions with the right amount of respect, we can see just how many unexplainable things people believe in. Also it is not a novelty that beliefs are used as a basis for literature. Neither is it that authors write about religion or the appearance of religion in literary works. Religion has an important role in both sci-fi and fantasy literature – although many would jump to contradict the former.We could list a number of works where this topic appears. But what about the other way around? Are there religions and belief systems out there with basics taken from fantastic literature? It must be stated before I begin my analysis: yes, the people who say that there are not many religions and beliefs that are openly or secretly based on speculative fiction. More to this, it is really difficult to separate the elements of fantasy from myths, or sci-fi and (pseudo-)scientific components. So if a system of principles has UFOs in it, one cannot be certain whether this is rooted in sci-fi, or if the examiner encounters with something that could be fitted into a fantasy environment, it could easily happen that he or she is incorrect. Nevertheless, it is a fact that there are groups where this effect can be pointed out, and certain fantastic elements manifested themselves into a separate religious entity; the easiest example to cite is the Necronomicon. In this article, I am going to mention the most well-known interconnections of SF and religion, purely with the purpose of scientific lecturing. Basically we could group the phenomena of this field into three groups: real religious or spiritual groups, theory systems; pseudo-religions, parody religions and other non-real theories; viewpoints which use fictional elements yet are not completely based on them. It might be hard to differentiate at the first sight, and overlaps can appear even during a discourse. This separation is merely a coincidental and not finalized scientific system, and it exists merely with the purpose of clarification. By looking at the first group, we cannot find many other religions apart from the Lovecraftian cults. More to this, I am only going to mention three of those, yet two of these are already beyond the scope of this definition. Based on their own definitions, the Ilsaluntë Valion is the group of individuals who are attempting to seek spiritual guidance through the works of J. R. R. Tolkien. According to their beliefs, Tolkien’s Middle Earth myth (to which they only refer to as the Legendarium) has the gnosis (which approximately means knowledge, the truth of the world), and although the masses only consider Tolkien’s works as entertaining literary pieces, they actually serve as guidelines to the human spiritual life. 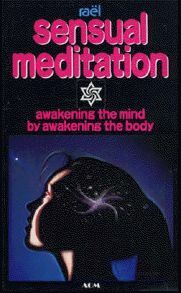 For them, the writings on Middle Earth are like The Bible for Christians: they think and meditate on them, then post factum analyse the experiences received during their “unconventional state of mind”, reaching conclusions which help them understanding the material and spiritual world (this is referred as the “gnosis”). So, the only difference between this group and any other group with gnosis-based principles is that they get their guidance from Tolkien’s works, and what he wrote down serves as the foundations of the group’s beliefs. The names of the ancient energies are also taken from these sources, and with these, they attempt to get the knowledge of the imaginary (“not real”) world. It is an interesting fact that apart from deep religious beliefs, this group also considers logical analysis and scientific knowledge important. The other religious group cannot be defined so easily. We should start at the beginning. In English-speaking countries, a strange religious group appeared during the 2001 census: a group of people referring to themselves as “Jedi”. It could not have been considered as a group back then, for the community of these people lacked even the most basic structure. What actually happened that people wanted to be sorted into the Jedi Order because of a quickly spreading invocation. And what could be the reason? Some of these people tried to express their dislike in religions in such a spectacular fashion, others thought it was nothing but a bit of harmless fun, and yet another group began to think seriously about what the Jedi religion of Star Wars could give them. As for the census, approximately 600.000 citizens confessed as being part of this group in some way (Jedi, Jedi Knight, Sith, etc.) in England and Wales (0.8%), in Australia (0.37%), New Zealand (1.5%), and in Canada. More to this, there was a small, recorded group even in Montenegro. It is hard to decide whether it was an actual religious phenomenon or a simply religious critique or geek humour solely on the basis of the afterlife of the invocation. (Of course, there are people who did not find this funny.) Yet the fact remains: one can encounter several websites referring to themselves as the sites of Jedi religion, but it remains uncertain whether these are based on serious religious conviction. However, those who take the Jedi religion seriously, they take it as a sort of mixture of Christianity, Buddhism, Tao and Shintoism. All in all, anybody can learn what I mean by simply watching Star Wars: the love of peace, unity with the Universe, love, deep meditation. And, of course, the Force. 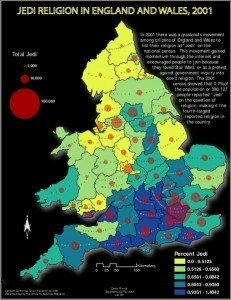 It is expected that there will be thousands of people considering themselves as Jedi in the upcoming census in 2011. This trend also appeared in Hungary. Yet it must be stated that the individual cannot be obligated to answer the question on someone’s religious beliefs – based on the principle of the freedom of conscience, which is guaranteed by the constitution. As an individual who deals with religion as his profession, I think that if somebody answers to the question on religious beliefs, he or she should only mark a denomination like the Jedi Order if the individual feels that he or she lives by its principles. Humour is very important, and expressing atheism is in everybody’s rights, but in some cases one has to weight the situation and act accordingly. Since this question on religious beliefs – just like the ones on marital status or habitation – have an important role on the big scale, for it serves as a base of comparison. This must be stated even for the sole reason to say that an individual who chooses the Jedi as a religion does not appear as an atheist in the statistics. he adventisms of Scientology were written up by L. Ron Hubbard in 1952, based on his former theories collected in the book called Dianetics. Based on how I established the groups above, this cannot be considered as a religion founded completely on science fiction, for it was not based on Hubbard’s old sci-fi texts but on his other pieces of mind. According to the beliefs of the church established in 1953, human beings are immortal beings, yet they forgot their true natures. By practicing this religion, members can reach a higher level of spirituality, and finally can reach a “clear” state, thus getting the forgotten knowledge. 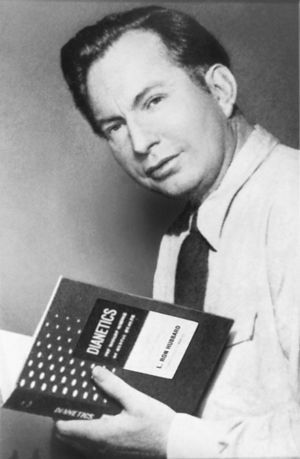 By looking at the religion’s adventisms, one can decipher that scientology is nothing more than the amalgamation of spiritualism and contemporary scientific understanding, with measurable data and scientific hypotheses. 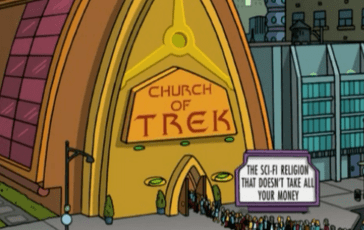 Of course, there are elements of this religion, such as Xenu and the so-called Galactic Federation, which can be considered as parts of a sci-fi background. But as I have stated in the introduction, nobody should be judged solely on the basis of the weirdness of his or her beliefs. Yet the fact remains that there are several people who condemn this church, and there are sanctions agains it in several countries (which often contradict the supposed principal of religious freedom). In the following years, many church-criticising individuals or groups referenced Russell’s teapot in their arguments. Yet many systems were born because of this teapot, systems that call themselves religions, yet not doing anything special except for mocking the existing religions, pointing out that these are often ridiculous to the non-believers. The most famous of these “fictitious” religions is the Church of the Flying Spaghetti Monster (it is often called Pastafarianism, a reference to the Rastafarian Movement). 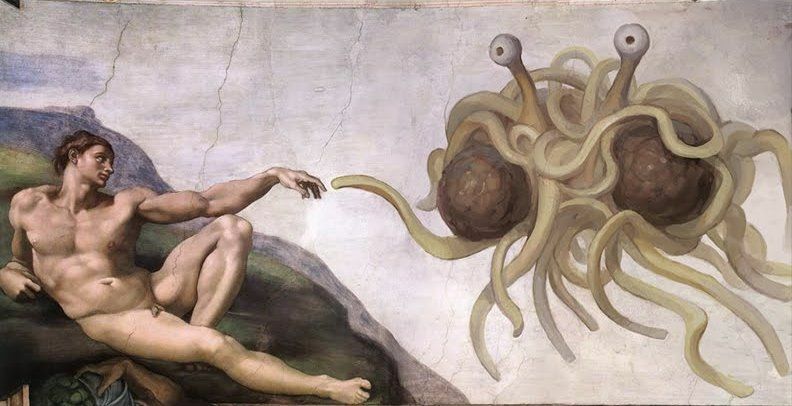 The Spaghetti Monster itself belongs to the group of younger pseudo-religions, it was created in 2005 with an open letter by a certain Bobby Henderson against the theory of intelligent desing. The letter exchange itself was so clever that nowadays it is considered the most well-known religion parody (the animated show South Park gave these words to Richard Dawkins). The Church of the Invisible Pink Unicorn is a similarly popular parody religion, where members engage in fictive religious debates on whether a unicorn can be pink and invisible at the same time. Almost all Christian religious trend has an own parody religion, such as the Landover Baptist Church, The Western Branch of American Reform Presbylutheranism or the Last Thursday movement. Of course, the fantastic also appears here as a source. For example, there is the Cthulhu Salvation Program, an Internet-based initiative which, not surprisingly, considers Lovecraft’s Great Old One as some sort of “saviour”. Boconism, stemmed from Vonnegut’s Cat’s Cradle is also similar to that one, which found its way into popular culture. Scientology has its own parody, the so-called cybology. This is a sort of scientific prank, its followers invigorate “mad scientist” and try to make fun of everything they can in the most varied methods imaginable. The Church of the SubGenius is also like this, and it has conspiracy theories, unidentified flying objects, and all in all, the entire popular culture on its plate. The number of parody religions is great, and it is expanding continuously. Here comes the last, but also the most diverse and difficult category. The easiest way to grasp this is by classifying all religious movements into this group which build on already existing religious traditions, but boost them different astrological, UFO-sighting and several other (pseudo-) scientific hypotheses. And from here on out, the scale is immensely diverse, ranging from apocalyptic trends to small communities expecting salvation from a small star. The one thing they have in common is that they consider alien visitors as transcendent entities, angels, divine messengers. The most famous of these religious groups is the Aetherius Society and the Raelian community, which considers itself “the largest UFO religion in the world”. Unfortunately there are many groups amongst the most infamous ones to which we can only remember because of cases of mass suicides, like Heaven’s Gate from California, which was founded in the 1970s. It became well-known when 38 of its members committed a mass suicide in 1997, because according to their beliefs, the Hale-Bopp comet, which was passing near Earth at that time, is an UFO which will transport their souls away from our planet. There are two other groups which worth examining. The first one, the Nation of Islam, because this is a tendency which – as its name says – fits its views into the Muslim faith, and their most central element is the Mothership which is going to take believers away when the World’s End happens. The other one is the Czech Vesmírní lidé sil světla (which means „The Cosmic Group of the Power of Light, more or less, but their more known name is the “Universe People” movement), and its central figure, Ivo A. Benda claims that he communicated with extra-terrestrial beings telepathically. In Hungary, the media does not pay much attention towards UFO-related religions, it is more common to run into the materials of different groups in the street, in which “fortune tellers”, “psychics”, and other people like them express their beliefs that they got in touch with visitors from Sirius, the New Star, the inside of the Sun, or other parts of the universe, or they just found a new Earth or Heaven. The variations are infinite. Some cite the Virgin Mother, God, or Jesus, or one of the apostles as their source. Of course we must not limit this colourful little group to just those whose beliefs stem from Christianity: there are ufonauts and followers which are atheist, believe in Eastern mysticism, or believe in extremely fancy principles. But these Hungarian groups tend to be extremely small, most of them couldn’t even achieve to be considered a church (according to the former religious law of Hungary, a church could be formed with just 100 members, but, among other things, this changed with the new law coming into effect on the 20th of July, 2011). And where do these connect to speculative fiction? This leads us to the appearance of the UFO phenomenon, and sci-fi literature definitely had a large effect on that field. But we will not begin a deeper analysis in this article. It is obvious that the fantastic does not have such an enormous effect on religions. Despite this, the topic deserves a more thorough examination, which gives a great example on how a pop-cultural phenomenon affects people’s beliefs. To sum it all up, I would like to stress that because of spiritual and religious freedom, and the respect of people’s rights, one must not be judged because of his or her beliefs, even if it appears to be weird at the first sight. Everybody has the right to choose a belief and live by it within civilized boundaries. This article was not written to mock the followers of the traditions mentioned above, just wanted to depict them from a specific point of view. And a little point of interest: Is Star Trek a religion? Hm először nem ment át….Ismét leírom Sajnálom hogy egy valószínűleg jó és érdekes írást nem tudok elolvasni. Bízok benne hogy nem az van mint a középkorban hogy a tudást csak latinul ismertették..így az egyszerű emberek nem fértek hozzá az Íráshoz…. Ez egy 2011-es sfmagos cikk angolra fordított változata, bárki számára évek óta hozzáférhető ugyanitt. Régebben is közöltünk angol cikkeket, mostantól vasárnaponként úgy tűnik, gyakrabban elő fog fordulni ilyen, de mindegyik egy régebben megjelent anyagunk fordítása. Minden vallás fikció, csak a “történelmi” agybajokat pár ezer éve találták ki, Xenut meg a jediket meg mostanában. Balfake, köszönjük, hogy megosztottad velünk bölcsességed kincstárának ezen páratlanul ragyogó ékkövét. De ha kérhetném, kicsit több tiszteletet azoknak, akik netán hisznek ezekben az “agybajokban”.